SOUSA: Thousands of people are believed to remain inside the Islamic State group’s last sliver of territory in eastern Syria, a US-backed force said Sunday citing evacuees, hampering the operation to crush the jihadists, reports AFP. The Kurdish-led Syrian Democratic Forces have been trying to flush jihadists from their last desert holdout in the village of Baghouz near the Iraqi border since January. At the time, Mazloum Kobani, the SDF’s top commander, estimated that the operation would take one month. 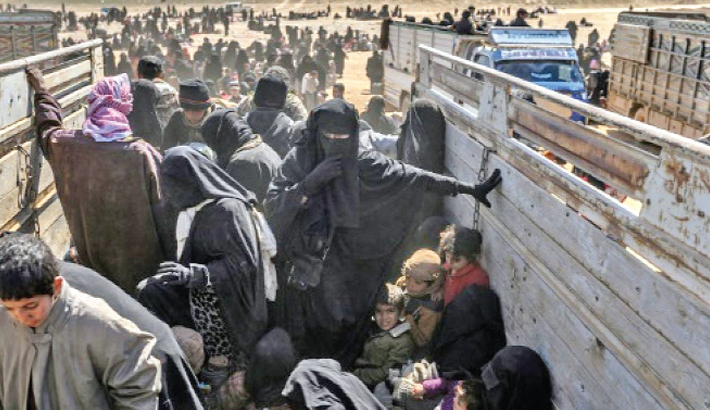 Thousands of men, women and children, as well as suspected jihadists, have poured out of Baghouz in recent weeks. The numbers have baffled the SDF and prompted them to pause the operation several times. SDF spokesman Kino Gabriel told a news conference Sunday that according to the latest group that quit the pocket, “an estimated 5,000 people” are still holed up inside. He cautioned, however, that the SDF has not been able to verify that figure. Those fleeing the enclave have previously reported widely inconsistent figures on the number of people still inside, ranging from thousands to a few hundred. Gabriel said there was no clear timeline for the end of the operation, but estimated that it may take several more days before IS is driven from its last pocket. “I hope it won’t take more than a week but this is a personal estimate,” he said in the village of Sousa in eastern Syria. Gabriel said that nearly 30,000 IS members and their relatives have surrendered to US-backed forces since January 9, including more than 5,000 fighters.